A favorite for more than 50 years! Roll the Cootie cube, be first to finish your Cootie to win. The original build a cootie bug game. Kooky and colorful - what a hoot! Start with a body, a head, and a hat. Lickin' lips, antennae, twirly tongue...look at that! Hundreds of ways to build'em. They're never the same. 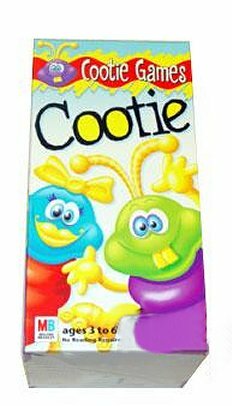 Finish your Cootie first and you win the game. A great game to get your really young started on. They will enjoy all the colors and learn a little at the same time. While they build their cootie.